Sample dozens of open-pollinated heirloom tomatoes—including favorites and rare varieties from SSE’s seed bank—at our annual FREE Tomato Tasting event. Attend demonstrations, judge a salsa contest, and celebrate fall in our beautiful gardens. 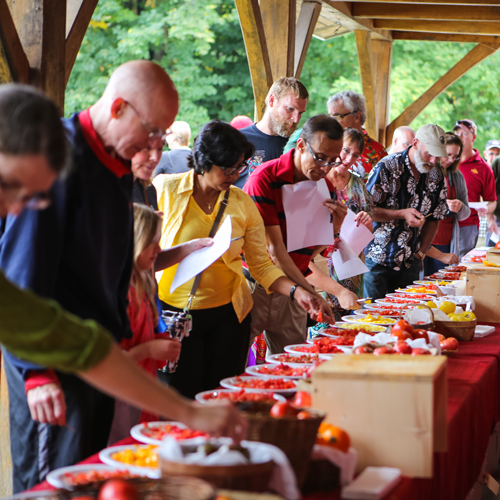 Enter Oneota Community Food Co-op’s Salsa Contest, held here at our annual Tomato Tasting. Pre-registration is required to compete in the Salsa Contest. Heritage Farm is just outside Decorah, Iowa. Why not make a weekend of your trip to Decorah?